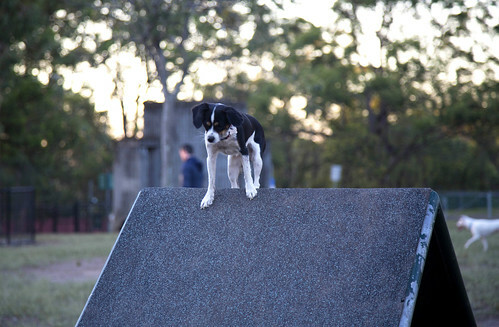 Brisbane City Council provides over 135 dog off-leash areas (commonly known as 'dog parks') in parks across Brisbane. Off-leash areas are generally fenced. Dogs can run, exercise and socialise leash-free with other dogs and dog park visitors. Dog off-leash areas include facilities such as seating, water, dog waste bins and some shaded areas. Some dog parks also include agility equipment for agility drills and shelters for dog park visitors. Use the location and region search boxes to help you search for a dog off-leash area. You can select to view all dog off-leash areas or those with areas for small dogs. You can view the results in a map, list or table by selecting your chosen option from the dropdown box. Check out our favourite dog park list. dog off-leash areas for small dogs only. is registered with Council, wormed regularly and its vaccinations are up to date. Contact Council to report maintenance issues in dog parks. View photos of some of our dog off-leash areas as a slideshow or view photos individually in our dog off-leash areas album in Council's Flickr account.